Orkon Aimag. Erdenet. Erdenet Mining Museum. Copper Mine. Orkhon aimag was established in 1994. Arich deposit of copper and molybdenum was discovered by Mongolian, Russian and Czechoslovakian geologists in the territory of the aimag in 1967-1970. In 1974, foundation of the "Erdenet" Soviet-Mongolian copper ore dressing enterprise was laid. Now the enterprise is considered as one of the ten biggest plants in the world. Construction of the enterprise became the first step in building a new city of Erdenet. The enterprise produces 25 percent of the total state budget, and 51.5 percent of the total national export products. Previously Orkhon aimag was a part of Bulgan aimag, therefore the biodiversity and climate are similar to those in Bulgan. Erdenet. Population 74,000. In the autonomous municipality of Orkhon, and not technically part of Bulgan aimag, Erdenet is Mongolia's third-largest city. The reason for Erdenet's existence is the copper mine, which employs about 8000 people and is the lifeblood of the city. 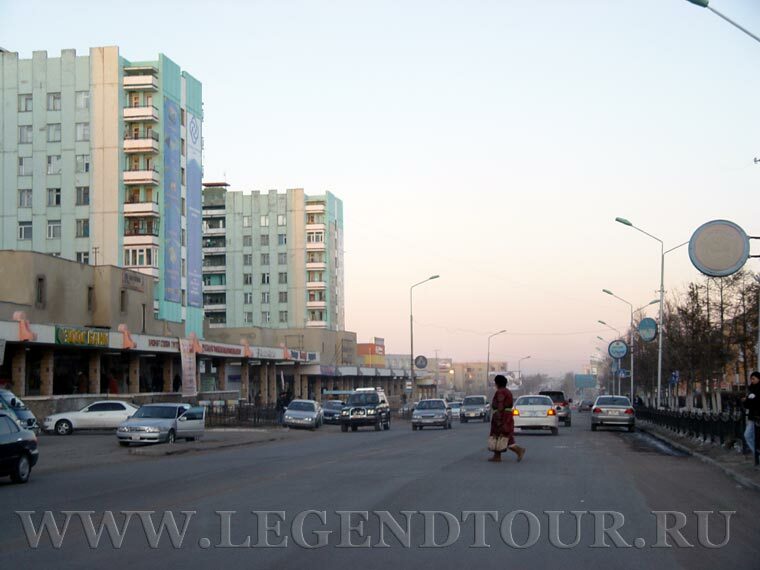 Erdenet is modern (built in 1974) and a bit soulless, but far nicer than most towns in the countryside. 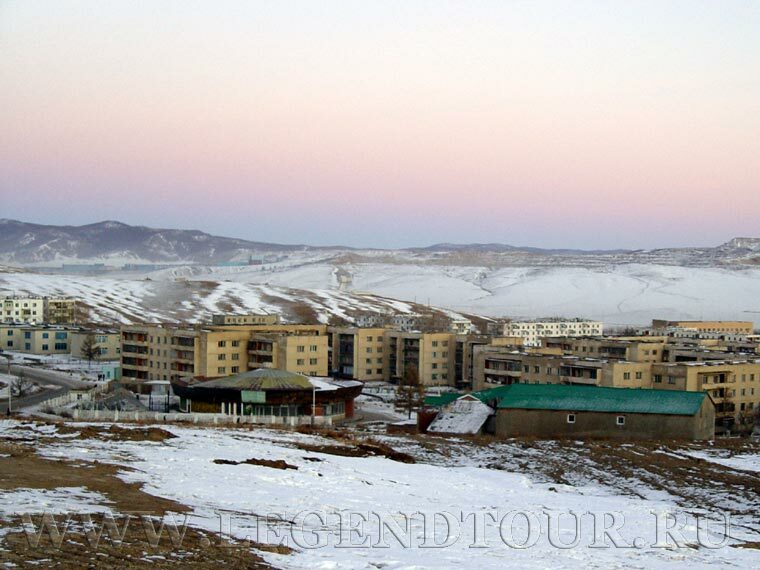 It is comparatively wealthy, so the facilities are the best outside of Ulaanbaatar. There is also a significantly large Russian community. Up to a third of the population of Erdenet was Russian during Communist times, though now only about 1000 Russians still work as technical advisers at the mine. There is evidence that Mongolians were making copper pots in the Erdenet area at least 200 years ago. Russian geologists initially recognized the area's potential during the 1940s. The copper was first seriously prospected during the 1960s, and by 1977 a train line to Ulaanbaatar was installed for hauling the ore. In 1981 an ore-processing plant was commissioned and Erdenet began exporting copper concentrate (30% copper), mostly to the former Soviet Union. There are rumblings about privatisation, but the cash-strapped Mongolian government isn't keen to sell off the mine, as it currently generates about 70 % of Mongolia's hard-currency earnings (depending on the current price of copper). In 1995, 208,000 tons of iron ore and 11,000 tons of molybdenum produced at the mine generated US$ 900 million for Mongolia. The mining and processing operation consumes nearly 70 % of Mongolia's electricity. Friendship Monument. This Communist monument, about 200m north-east of the Selenge Hotel, is worth a quick look. 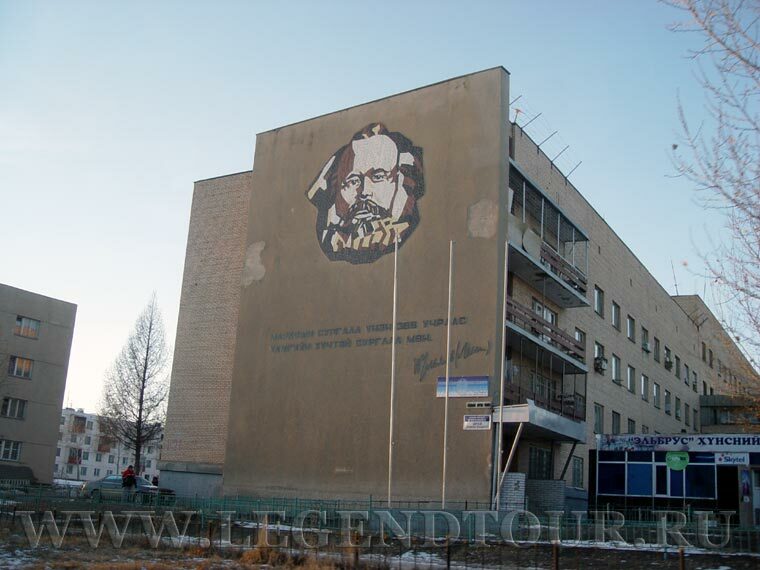 On the way you pass a fine Marx mural and a picture of Lenin bolted to the wall. A little further to the east, the ovoo is impressive if you haven't seen too many before. The hills north of the monument and south of the stadium are great for short hikes. Mining Museum. This Soviet-built museum belongs to the copper-mining company, Erdenet Concern. It's on the 2nd floor of the Culture Palace, and is worth a look. Open-cut mining is more damaging to the environment but infinitely safer than digging mine shafts below the surface. Also, since this particular mountain is almost solid copper and molybdenum ore, this is the only practical way to reach it. The mine operates 24 hours a day, 365 days a year. The map of Bulgan aimag and Orkhon.